2 unit investment property that "could be" converted back to a single family home. The main level of the property has a living room, bedroom, dining room, kitchen, full bath and has access to the partial basement. The second level has a bedroom, living room, kitchenette and full bath. Each unit has separate utilities and the Seller pays water and trash only. There is a 24X20 detached 2 car garage, built in 1997, that could easily be rented for additional income. Main level apartment rents for $375 per month and the second level apartment rents for $350 per month. 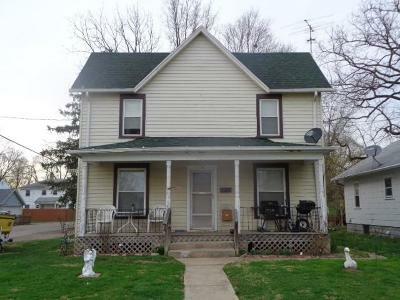 The property looks across the street at a large, vacant lot and is situated on a corner lot with no rear neighbors.